Known as a political-poetical graffiti artist, Basquiat’s body of work is a Neo-Expressionist and Primitivism aesthetic. 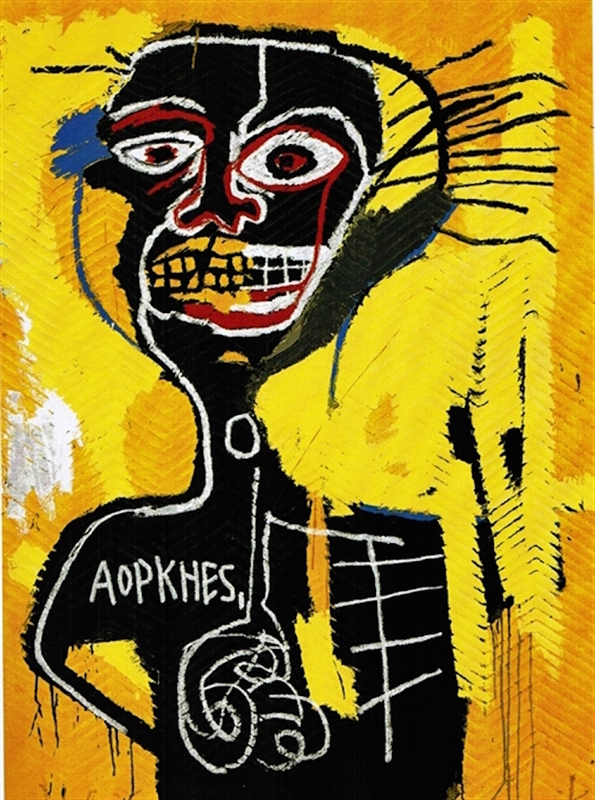 Encoding a series of words and symbols, Basquiat represents elements of his cultural heritage as a social commentary on racial segregation and alienation. The loosely defined and abstracted image reflect a fragmented and torn individual. This collection of Estate Prints includes some of Jean- Michel Basquiat’s most highly desirable and collectible artworks. Fascinated by anatomy from a young age (his mother gave him a copy of Gray’s Anatomy when he was 7), heads and skulls became recurring images in Basquiat’s work in the early 1980’s. Recalling the style of his graffiti and his paintings, he rendersspontaneous lines, creating a layer of bright colors that really pop against the background. Jean-Michel Basquiat was a Neo-Expressionist painter in the 1980s. He is best known for his primitive style and his collaboration with pop artist Andy Warhol. Basquiat was born on December 22, 1960, in Brooklyn, New York. He first attracted attention for his graffiti under the name “SAMO” in New York City. With a Haitian-American father and a Puerto Rican mother, Basquiat’s diverse cultural heritage was one of his many sources of inspiration.A self-taught artist, Basquiat began drawing at an early age on sheets of paper his father, an accountant, brought home from the office. As he delved deeper into his creative side, his mother strongly encouraged to pursue artistic talents. Basquiat first began working with a close friend, he tagged subway trains and Manhattan buildings with cryptic aphorisms.In 1977, Basquiat quit high school a year before he was slated to graduate. To make ends meet, he sold sweatshirts and postcards featuring his artwork on the streets of his native New York. Three years of struggle gave way to fame in 1980, when his work was featured in a group show. His work and style received critical acclaim for the fusion of words, symbols, stick figures, and animals. Soon, his paintings came to be adored by an art loving public that had no problem paying as much as $50,000 for a Basquiat original.